Enamel film insulated rectangular copper conductors are known as enamelled copper strips. The manufacturing process of enamelled strips, are essentially same as round wires, but most critical. The rectangular shape of copper conductors with nominal corner radii, helps to pack maximum copper in small space. This characteristic is beneficial in design aspect of the transformer windings. At the same time the insulation strength and flexibility has to be excellent to withstand the winding stresses, bending / shaping etc. At Salasar Copper, we provide very special attention towards the flexibility and adherence of the insulation film of enamelled strips. We have many esteemed and satisfied customers using enamelled strips for critical applications. 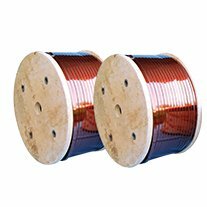 Super Enameled Copper Strips are used in various types of transformers.